Citation: Das J, Rene ER, Krishnan J. Photocatalytic degradation of volatile pollutants. J Environ Chem Toxicol. 2018;2(2):57-59. Photocatalytic oxidation is a promising technology for the removal of gasphase volatile organic compounds. This technique is cost-efficient, simple to perform, yields high removal of the pollutants and does not generate large quantities of waste. In this mini-review, the application of photocatalytic oxidation for waste-gas treatment, the mechanisms involved and the operational aspects to be considered for enhanced reactor performance has been reviewed in brief. Photocatalyst; photoreactor; waste-gas; volatile organic compounds; elimination capacity. The Volatile Organic Compounds (VOCs) are an important class of air pollutant that is of health and environmental concern. The United States Environmental Protection Agency has stipulated clear guidelines on the toxic threshold levels of different VOCs and also recommended stringent guidelines for polluting industries. From a pollution control view point, a wide variety of VOCs can be mineralized to innocuous end-products using a photocatalyst such as TiO2 [1,2]. Gas-phase heterogeneous photocatalysis using TiO2 was first explored by Dibble et al. . In those previous works, the authors reported high levels Trichloroethylene (TCE) destruction, i.e. removal. Since then, extensive research pertaining to the photodegradation of volatile aldehydes, ketones, alcohols, aromatics and chlorinated compounds have been carried out by different researchers [4-11]. The principle of Photocatalytic Oxidation (PCO) depends on the use of a semi-conductor such as TiO2 and Ultraviolet (UV) light to transform VOCs into less harmful (innocuous) products . The vital step in PCO is the separation of two types of carriers: an electron (e-) and a hole (h+) which requires the illumination of the TiO2 surface and absorption of photons with sufficient energy to promote an electron from the valence band (VB) to the Conduction Band (CB) [1,7]. The hydroxyl radical (OH•) is produced during photocatalysis which acts as a powerful redox transient species in photocatalysis. As the most powerful oxidizing agent, it is mainly responsible for being able to attack the VOCs, i.e. to degrade the pollutants . The photocatalytic oxidation of volatile pollutants to end-products and the basic PCO reaction mechanisms are shown in Figure 1 and Table 1, respectively. High chemical stability, high oxidizing capability, non-toxicity and low cost are the main advantages of applying TiO2 in a wide range of environmental engineering applications [1,2]. Anatase, brookite and rutile are the three existing crystalline modifications of TiO2 . There are several TiO2 photocatalysts having different morphological designs such as nanoparticles, hollow fibres, nanotubes and mesoporous structures. Several factors such as the crystallinity, crystal size, crystalline phase, accessible surface area, pore size, pore structure and adsorption capacity determine the performance of TiO2. Besides, There are some promising technologies for modifying TiO2 photocatalytic efficiency, i.e. metal doping (doped with metal like Fe, Cu, Ni, V, Pt, Pd, Ag, Ru, Co and Mn), non-metal doping (doped with non-metal like B, C, N and S) and co-doping (e.g. doped with B and Fe) which can enhance the photocatalytic activity through increasing the charge separation and shifting ‘the light absorption range towards visible light’. Various commercial TiO2 based photocatalysts (e.g. Hombicat® UV100, Aeroxide P25 and Aerolyst 7710 from Evonik®) are available for the removal of VOCs. The photocatalytic conversion of VOCs can be in the range of 30-100% depending on several factors: type of support materials, type of VOCs, VOC concentration and composition, the oxidation/reaction pathways, residence time, relative humidity and light intensity [1,2]. Two typical examples where PCO can be applied are the petrochemical industry and the pharmaceutical industry. These two industries produce wastegas that contain high concentrations of aromatic hydrocarbons, aliphatics, amines and other trace organics. The composition and concentration of the waste-gas often vary, i.e. with operational time of the day, depending on the production/manufacturing schedule of the process industry, the raw materials used, the end-products produced and the efficiency of the process unit. The performance of photocatalytic reactors will depend on the pollutant characteristics such as solubility, adsorptivity, bond structure, potential degradability and operating conditions. Furthermore, competitive effects such as pollutant-pollutant interactions, pollutant-photocatalyst interaction, pollutant-intermediate interaction and abiotic factors can also play an important role in determining the mass transfer characteristics and the photo (catalytic) degradation steps. In some instances, however, depending on the nature of the parent VOC, the production rate of the intermediates may be higher than the removal rate of the pollutant itself. This could cause malfunctioning of the reactor setup, leading to transient-type behaviours and a reduction in the elimination capacity/removal efficiency [12,13]. According to Kovalevskiy et al. , adsorption of pollutants on the surface of the photocatalyst is an important step that determines the success of every PCO process. Thus, it is recommended to choose a photocatalyst that offers high surface area and that has high moisture retention capacity to facilitate the PCO reaction. It is also recommended to increase the photocatalytic performance by increasing the surface area of the catalyst which can be done by immobilizing the photocatalyst (e.g. TiO2) on porous supports . Besides, the hydrophobic or hydrophilic properties of the pollutant, the functional groups on the photocatalyst and also the ability of the intermediates formed to adhere to the surface of the photocatalyst should be carefully considered [16,17]. Catalytic deactivation, e.g. blockage of the active sites, fouling and aggregation of the photocatalyst (TiO2), dehydroxylation of TiO2 surface, generation of by products and inefficiency are the main limitations of the PCO process. However, there are various approaches to regenerate the photocatalyst by just passing dry air under UV light for a long period of time, high temperature calcination, ozone-purging in the presence of humidity, etc, among others. The photocatalytic activity can also be enhanced by using any one of the following strategies: vacuum based UV treatment, VUV irradiation instead of UV irradiation, activated carbon or porous silica to provide superior porous support, and the use of doubly open-ended structure of TiO2 nanotubes [1,15,18,19]. The recent literature reports (only representative) on the application of PCO for waste-gas treatment are shown in Table 2. As evident from these studies, most of the research on PCO have been carried out under ideal, laboratory conditions [20-23]. Hence, for future studies, several important concerns should be considered: (i) understand the hydrodynamics of the PCO reactor under multi-phase flow conditions, (ii) flow visualization tests, (iii) ascertain the rate-limiting step of the PCO process, (iv) development of novel photocatalyst, and (v) process scale-up and cost-benefit analysis. Mamaghani AH, Haghighat F, Lee CS. Photocatalytic oxidation technology for indoor environment air purification: The state-of-the-art. Appl Catal B Environ. 2017; 203: 247-269. 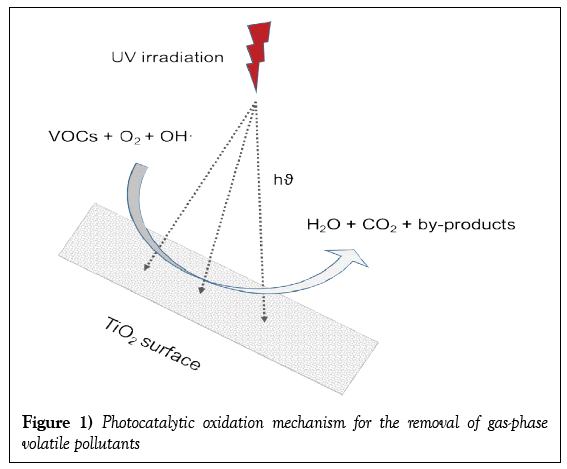 Shayegan Z, Lee CS, Haghighat F. TiO2 photocatalyst for removal of volatile organic compounds in gas phase-A review. Chem Eng J. 2018; 334: 2408-2439. Dibble LA, Raupp GB. Kinetics of the gas-solid heterogeneous photocatalytic oxidation of trichloroethylene by near UV illuminated titanium dioxide. Catal Letters. 1990; 4: 345-354. Alberici RM, Jardim WF. Photocatalytic destruction of VOCs in the gas-phase using titanium dioxide. Appl Catal B Environ. 1997; 14: 55-68. Shen YS, Ku Y. Treatment of Gas-phase Volatile Organic Compounds (VOCs) by the UV/O3 Process. Chemosphere. 1999;38:1855-1866.
d'Hennezel O, Ollis DF. Trichloroethylene-promoted photocatalytic oxidation of air contaminants. J Catal. 1997; 167: 118-126. Castellote M, Bengtsson N. Principles of TiO2 photocatalysis. In: Ohama Y and Van Gemert D (Eds.) Applications of Titanium Dioxide Photocatalysis to Construction Materials. pp. Springer Netherlands. 2011; 5: 5-10. Sánchez B, Cardona AI, Romero M, et al. Influence of temperature on gas-phase photo-assisted mineralization of TCE using tubular and monolithic catalysts. Catal Today. 1999; 54: 369-377. Jung KY, Park SB. Anatase-phase titania: preparation by embedding silica and photocatalytic activity for the decomposition of trichloroethylene. J Photochem Photobiol A Chem. 1999; 127: 117-122. Ku Y, Ma CM, Shen YS. Decomposition of gaseous trichloroethylene in a photoreactor with TiO2 coated nonwoven fiber textile. Appl Catal B Environ. 2001; 34: 181-190. Lim TH, Kim SD. Trichloroethylene degradation by photocatalysis in annular flow and annulus fluidized bed photoreactors. Chemosphere. 2004; 54: 305-312.
da Costa Filho BM, Araujo ALP, Silva GV, et al. Intensification of heterogeneous TiO2 photocatalysis using an innovative micro-meso-structured-photoreactor for n-decane oxidation at gas phase. Chem Eng J. 2017; 310: 331-341. Mothes F, Ifang S, Gallus M, et al. Bed flow photoreactor experiments to assess the photocatalytic nitrogen oxides abatement under simulated atmospheric conditions. Appl Catal B Environ. 2018; 231: 161-172. Kovalevskiy NS, Lyulyukin MN, Selishchev DS, et al. Analysis of air photocatalytic purification using a total hazard index: Effect of the composite TiO2/zeolite photocatalyst. J Hazard Mater. 2018; 358: 302-309. Šuligoj A, Štangar UL, Ristić A, et al. TiO2-SiO2 films from organic-free colloidal TiO2 anatase nanoparticles as photocatalyst for removal of volatile organic compounds from indoor air. Appl Catal B Environ. 2016;184:119-131. Suárez S, Jansson I, Ohtani B, et al. From titania nanoparticles to decahedral anatase particles: Photocatalytic activity of TiO2/zeolite hybrids for VOC oxidation. Catal Today. 2018. Qian X, Ren M, Yue D, et al. Mesoporous TiO2 films coated on carbon foam based on waste polyurethane for enhanced photocatalytic oxidation of VOCs. Appl Catal B Environ. 2017; 212: 1-6. Ji J, Xu Y, Huang H, et al. Mesoporous TiO2 under VUV irradiation: enhanced photocatalytic oxidation for VOCs degradation at room temperature. Chem Eng J. 2017; 327: 490-499. Weon S, Choi J, Park T, et al. Freestanding doubly open-ended TiO2 nanotubes for efficient photocatalytic degradation of volatile organic compounds. Appl Catal B Environ. 2017; 205: 386-392. Dibble LA, Raupp GB. Fluidized-bed photocatalytic oxidation of trichloroethylene in contaminated airstreams. Environ Sci Tech. 1992; 26: 492-495. Mamaghani AH, Haghighat F, Lee CS. Photocatalytic degradation of VOCs on various commercial titanium dioxides: Impact of operating parameters on removal efficiency and by-products generation. Build Environ. 2018; 138: 275-282. Stucchi M, Galli F, Bianchi CL, et al. Simultaneous photodegradation of VOC mixture by TiO2 powders. Chemosphere. 2018; 193: 198-206. Liu HS, Cheng J, Zhang, et al. The gas-photocatalytic degradation of trichloroethylene without water. Chemosphere. 1997; 35(12): 2881-2889.